I want rice that's fluffy and tender, never mushy or crunchy. There's this funny thing where I can execute finicky pastries and complex sauces, but when it comes to the basics I often mess up. Maybe it's just carelessness (or arrogance). But really good rice is a devine thing, and worth anyone's attention. I'm not talking about sesoning sushi rice, but cooking short-grain rice perfectly. It turns out the trick is pressure. If you don't have a rice cooker, you can acheive this by creating a tight seal, and weighting the lid of the pan. I put a big cake pan on top of my cooking pot instead of a lid, then weight it with another heavy pot, some big cans of beans, or whatever I can find. Look around your kitchen (heavy chopping block? cast iron skillet?) and improvise. You'll want about 1 1/2 cups of water to 1 cup of rice, and a pinch of salt. Rinse the rice several times in cold water, then drain it and add the water for cooking. Another way to measure is by resting your hand on top of the rice: the water should just cover your fingers. Turn the heat to high. 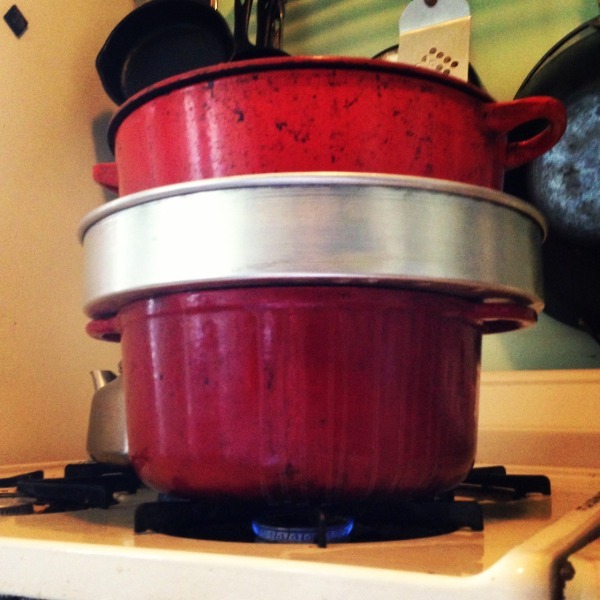 As soon as you hear the water rumble to a full boil, turn the burner to low and set a timer for 18 minutes. DO NOT LIFT THE LID. After 18 minutes, turn the burner to high and count to 60, then turn off the burner (if it's an eletric stove, remove the pan from the heat). DO NOT LIFT THE LID. Set a timer for 5 more minutes. This might sound complicated, but really its easy. And it will likely be the best rice you've ever made.